On Reality Asserts Itself, Mr. Finkelstein describes the “necessity” of Israel proving its destructive capabilities. PAUL JAY, SENIOR EDITOR, TRNN: Welcome back to Reality Asserts Itself on The Real News Network.In his book Method and Madness, Norman Finkelstein wrote, Israel’s evolving modus operandi for restoring its deterrence capacity describes a curve steadily regressing into barbarism. 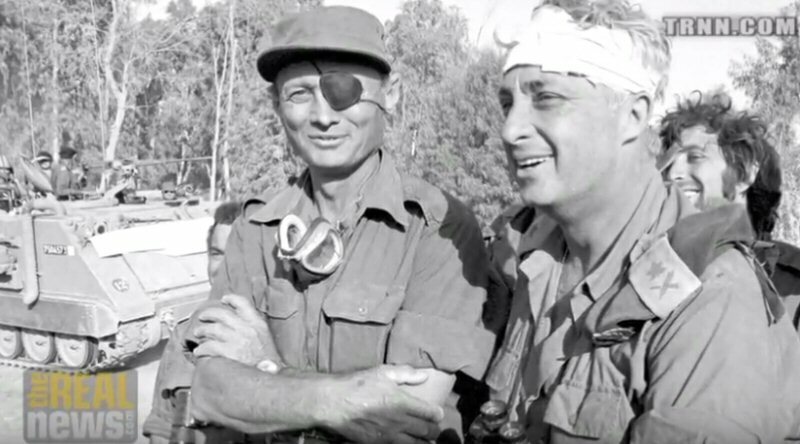 Israel gained its victory in 1967 primarily on the battlefield, albeit in a, quote, Turkey shoot, while in subsequent hostilities, mostly in Lebanon, it sought both to achieve a battlefield victory and to bombard the civilian population into submission. But Israel targeted Gaza to restore its deterrence capacity because it eschewed any of the risks of conventional war. It targeted Gaza because it was largely defenseless.Further down, Norman writes, a supplementary benefit of this deterrence strategy was that it restored Israel’s domestic morale. A 2009 internal UN document concluded that the invasion’s “one significant achievement” was that it dispelled doubts among Israelis about, quote, their ability and the power of the IDF to issue a blow to its enemies. The use of excessive force proves Israel is the landlord (…) The pictures of destruction were intended more for Israeli eyes than those of Israel’s enemies, eyes starved of revenge and national pride.Near the end of his book, Norman writes, in the Gaza Strip, they (meaning the people of Gaza) preferred to die resisting rather than continue living under an inhuman blockade. The resistance is mostly notional, as the makeshift projectiles caused little damage. So the ultimate question is: do Palestinians have the right to symbolically resist slow death punctuated by periodic massacres? Or is it incumbent upon them to lie down and die?Again joining us in the studio is Norman Finkelstein.Thanks for joining us again, Norman. JAY: So, just quickly again, Norman is one of the foremost scholars of the Israeli-Palestinian conflict, and as I mentioned, his latest book: Method and Madness: The Hidden Story of Israel’s Assaults on Gaza.So talk about this deterrence capacity, the necessity of Israel to prove the destruction it’s capable of wielding. FINKELSTEIN: Okay. That’s a good question. The evidence is as follows, the evidence I prefer to lean on. There’s all sorts of evidence, but I’ll use the evidence I prefer to lean on. People quote the the famous statement by Prime Minister Menachim Begin at the national war college of Israel in July 1982. It was during the Lebanon War. And Menachem Begin had been a member of the national unity government that was formed in 1967, so he knew all the inner workings. And he famously said in this 19–July 1982 lecture at the national war college, he said, let’s be honest with ourselves: there was no evidence that Nasser was going to attack; we decided to attack first. But that to me is–that’s some evidence. It’s not necessarily definitive evidence, because Begin at that time was trying to defend his decision to attack Lebanon in June 1982.But internal evidence, which I consider overwhelmingly supportive of what I’m about to say, is the Israelis, they desperately needed–in 1967 they needed the U.S. green light because they were afraid if they attack like they did in 1956, that the U.S. president is going to force them to withdraw, just like Eisenhower forced Israel to withdraw in 1956. So they wanted that American green light, so once they attacked, they wouldn’t be forced to unilaterally withdraw. And so they were sending all of their officials here to show evidence that we’re facing a existential threat from Egypt, Egypt is going to attack.And so Johnson took all the evidence–Lyndon Johnson, the president at the time–he gave it to, like, six or seven U.S. security organizations, the equivalent of–like, I don’t know if it’s the same name now then, but it was, like, the National Security Council, the CIA, all of the organizations. He asked them, okay, vet the Israeli information, use your own information–what do you come back with? And each time he checked with them, they kept saying, there’s no evidence that Egypt is going to attack. And they also said, if there were an attack, and even if it were a concerted attack, it’s clear that Israel’s going to, in the famous statement, Johnson–I was talking to Israeli official. I think it was Abba Eban, the foreign minister, but I can’t say for sure. And he says that all our intelligence shows us, number one, Egypt is not going to attack, and number two, if they do–and Johnson’s famous line was: you’re going to whip the hell out of them.Now, you might say, well, that says what the Americans thought; what about what the Israelis thought? It’s very interesting. On June 1–that’s just a few days before the Israeli attack–the head of Israeli intelligence, Meir Amit, he comes to Washington. He’s consulting. He’s also trying to convince and he’s also trying to sniff out what will the U.S. do if we attack. He meets with the American intelligence. And what does he say? He says, our intelligence agrees with all of your intelligence about whether Nasser will attack and what will happen if he is–attacks. So there’s complete agreement across the board–American intelligence agencies, Israeli intelligence agencies: Nasser is not going to attack; Nasser, even if he did, we will whip–Israelis will whip the hell out of them. Which brings is now back to your question.The question is: then why did Israel attack? And the response–one of the responses, the one by Ariel Sharon–because there was a split in the cabinet whether or not–Israeli cabinet–whether to launch the first strike. And Sharon said, if we don’t–this was Ariel Sharon. It’s the same cast of characters–goes back quite a ways. Ariel Sharon, he says, if we don’t attack, it’s going to diminish our deterrence capacity. What does that mean? Because Nasser was making all of these noises, Nasser did close the Straits of Tehran, Nasser did move troops into the Sinai, and Nasser–you know the rhetorical flourishes about we’re going to defeat Israel and so on and so forth, and so had whipped up a kind of ecstatic hysteria in the Arab world, finally, to challenging Israel.Now, de facto–de facto–Nasser was a windbag–a congenital problem in the Arab world, leaders who are windbags–and obviously there was nothing backing his claims, but they thought that this was whipping up too much of a hysteria in the Arab world; it’s time to remind them who’s in charge. JAY: Well, then we get this term deterrence capacity. FINKELSTEIN: Deterrence capacity. And incidentally, the expression “turkey shoot”, that came from the national security adviser Walt Rostow. And he says, well, yeah, it was–the Israelis attacked. He said, well, it was more like a turkey shoot, which is what it was. JAY: And I should mention, in Method and Madness, all the sources for this are there. So if you want to know how we know so-and-so said what they said, check out the book, ’cause it’s very–the notations are very detailed. Well, then, this deterrent–. FINKELSTEIN: That’s exactly what I was going to get to. That’s exactly–we’re on the same wavelength. So the book begins with the Israeli attack on Gaza Operation Cast Lead in 2008, December 27, 2008, to January 17, 2009. So what was the Israeli purpose behind that? It’s deterrence capacity–its ability to frighten, terrify the Arab world. It suffered a real blow during the July-August 2006 war in Lebanon. Israel went in with a full force of its high-tech killing machine, inflicted massive death and destruction. About 1,200 Lebanese were killed. Of those 1,200, about 1,000 were civilians, 200 were Hezbollah fighters.But Israel was very careful not to launch a ground invasion, because you don’t want to go to war, hand-to-hand combat, with the Party of God, the Hezbollah. I’ve met Hezbollah fighters. They’re serious, and they want nothing more than to tangle with Israelis, and Israeli soldiers did not want to tangle with the Party of God. The long and the short of it was Israel, as I say, used its high-tech killing machine for about three weeks’ time–well, it was 34 days. But after about–okay, let’s call four weeks’ time. And then it was clear that the only option now was to launch the ground invasion, because the Hezbollah had these–. FINKELSTEIN: Two thousand six. Hezbollah–Israel claims it knocked out the medium- and long-term missiles. I don’t know if that’s necessarily true, but let’s for argument’s sake accept it. The problem was these short-range rockets that Hezbollah had. You can’t disable them from the air. The only you can disable them was with a ground invasion. And Hezbollah kept firing more and more and more, and not inflicting massive damage, but showing it’s still resisting. The only way to get rid of them is, as I said, through a ground invasion. Israel did not want a ground invasion, because it knew it would suffer significant combatant casualties.And so Condoleezza Rice in the UN was blocking any resolution ending the conflict. Then it was clear, we’d better end this now because we’re in a mess. And so Condoleezza Rice finally allowed the resolution to pass in the Security Council and the Lebanon so-called–well, it was a war–in some ways was over. It was horrible what the Israelis did at the end. It’s all completely forgotten. The resolution was passed. The war was over. All that was waiting was now implementation on the ground. Everybody agreed the war is over. What did Israel do in the last 72 hours? It’s all completely eliminated from the historical record. It dropped 4 million–4 million cluster bomblets on South Lebanon, saturated the whole of South Lebanon. It was like a science fiction movie.JAY: How do we know this? FINKELSTEIN: Oh, you just look at the Human Rights Watch report. It was called Flooding South Lebanon. It’s a very vivid depiction of the monstrousness of what Israel did. It depicts homes, their roofs; through the windows the cluster bomblets enter. Entire apartments are just saturated with them, 4 million cluster bomblets.In any case, that’s a separate issue maybe one day I’ll come back and talk about, but for now the point is Nasrallah kept referring to it as our divine victory. JAY: Nasrallah, leader of the Hezbollah. FINKELSTEIN: Yeah, the head of the Hezbollah, Sayed Nasrallah, kept referring to it as our divine victory. And that, of course, shook up the Israelis, ’cause it was like Nasser, but with a real victory. And it was time–they had to figure out a way to restore their deterrence capacity. And they chose Gaza. And in a typical cowardly way, they chose a place which was utterly defenseless and then proceeded to–. JAY: Prove how tough they are. FINKELSTEIN: Prove how tough they are against a defenseless victim in Operation Cast Lead. About 1,400 Palestinians were killed.JAY: This was 2009. FINKELSTEIN: Two thousand eight, nine, of whom about–up to 1,200 were civilians. They left behind 600,000 tons of rubble, which was actually–it paled in comparison to what they did during Operation Protective Edge this past summer. Protective Edge was much worse. But it also was different because the Palestinians did manage to produce, to build the tunnel system. And because of the tunnel system, they were able–the tunnel system was–the tunnels were not vulnerable to artillery strikes or air attacks. They were pretty impressive. Anyone who knows the Arab world knows every–four out of every three Palestinians is a civil engineer, and in Gaza you have a lot of unemployed civil engineers. And so with very primitive implements they’d actually built a very impressive, sophisticated catacombs, tunnel system in Gaza.And so, when Israel went in, it never went very far in. There was a misunderstanding about that. They basically stayed on the border, because the Palestinians were coming out, the Hamas fighters were coming out of the tunnels. And there was–it’s not Stalingrad, it’s not Leningrad, but in the first Operation Cast Lead, ten Israeli combatants were killed. Of those ten, four of the ten were killed from friendly fire, which means only six were actually killed by Hamas fighters.This time it was different. It was 67 Israeli combatants who were killed. And they were basically killed for two reasons. First of all, the Hamas fighters appeared to have been more sophisticated this time. It said they were trained by Hezbollah, but I don’t know. But secondly, it was their tunnel system. JAY: But your main point here is that the fundamental reasons for attacking Gaza is to sort of reassert the fear factor. FINKELSTEIN: Fear factor. But there was also a second factor, which I discuss at equal length, which is the peace offensive, that every time Hamas was becoming too respectable, every time Hamas was becoming too reasonable, every time Hamas was upholding the terms of the ceasefire it had signed with Israel, there was the fear by Israel that somebody will say, well, if they’re respecting agreements, if they’re carrying on in a responsible fashion, then why don’t you negotiate with them? And the Israelis have a nice–or one Israeli political scientist (his name is Avner Yaiv), he coined a nice expression. He called it the fear of Palestinian peace offensives–they’re becoming too reasonable. And so we have to hit them hard so that the quote-unquote radical and extremist elements will gain the upper hand internally. So every time there’s a Palestinian peace offensive, Israel launches one of its murderous invasions. And that’s exactly–. JAY: And the sort of–I guess one of the nightmares of the Israelis in terms of all this is some reunification with Hamas and Fatah and the PLO. And that’s exactly what happened. They created this unity government. FINKELSTEIN: Right. And that’s actually how–that’s the proper starting point for what happened in Gaza this past summer. It was called the government of national consensus that was formed at the end of April 2014. And surprisingly, the United States and the European Union, they did not immediately break off relations with the new government, because technically Hamas is or has–a terrorist organization in the U.S., a terrorist organization in the E.U. So you would have expected the U.S. would break off relations and the E.U. would, but they did not.Part of it, I think it was punishment because of the Kerry peace initiative, which was sabotaged by Netanyahu, and they wanted to get even with him for that. So they said, no, we’ll take a wait-and-see approach with the Hamas government. And this inflamed and incensed Netanyahu, because this is the second time these countries are dealing with terrorists. The first, of course, is Iran. They’re in the midst of these negotiations with this government that’s threatening a second Holocaust against Israel and all that sort of nonsense. And now they’re negotiating with Hamas, which, you know, wants to destroy Israel. But all Netanyahu could do was fume. He wasn’t able to do anything about it until in June of this past year: when the three kidnappings occurred of the Israeli teenagers, he found his opportunity. He decided to use that as a pretext. He knew the kids were killed, were dead almost within 24 hours. He knew all that. JAY: So he didn’t have to go looking for them. FINKELSTEIN: Yeah.JAY: And it was also known almost right away that Hamas leadership were not in on this. FINKELSTEIN: Exactly. He knew all that. But they used it as a pretext to lunch what they called Operation–.JAY: In your book you call it a gift. It’s–. FINKELSTEIN: Yeah, they are gifts. But these are politicians. You know, sometimes people feel like when you say expression like gift, that’s just a little bit too callous. They’re politicians. After 9/11, yes, Rumsfeld, Condoleezza Rice, Cheney, they got in their little office, they shed their salty tears, and then 15 minutes later they said, now, what are we going to do with it? Now let’s get down to serious business. We’re not here to cry. And it’s the same thing with Israel. Okay, three kids are killed. We’re not happy about that. Now, what can we do with it? And so he launches Operation Brother’s Keeper, Israeli troops go on a rampage in the West Bank, kill Palestinians, demolish Palestinian homes, arrest 500 militants from Hamas, knowing full well that this is going to evoke a violent reaction from Hamas. And then, when they get that violent reaction, they can say exactly–. JAY: Violent reaction meaning rockets that basically don’t hit very much. FINKELSTEIN: Right, or some crazy thing, whatever is going to happen. And then Netanyahu can say, as he did say a few weeks later, he said, quote, never second-guess me again on Hamas; when I say they’re a terrorist organization, they’re a terrorist organization. And now he had his proof. And so he exploited the opportunity. JAY: ‘Cause as long as he can keep Hamas, as a terrorist organization, out of the talks, any possibility of any reconciliation or deal is off the table. FINKELSTEIN: Right, because he then says the Palestinian Authority doesn’t represent all Palestinians. So how can we negotiate a deal with them? The whole purpose is–. JAY: And he comes to Congress and they stand up 27 times or whatever the crazy number of standing ovations was. FINKELSTEIN: Mhm. But now he–I think he went a little too far with the last visit to Congress. JAY: Okay. We’re going to talk about that and where we’re at in the next segment.Please join us for the continuation of our discussion with Norman Finkelstein on Reality Asserts Itself on The Real News Network.